Relax after work – or any time - with our extensive wine list, signature cocktails, craft beers and share plates. Our chic waterfront patio is the perfect place to unwind in the summer season, with cozy fire pits to keep you glowing. 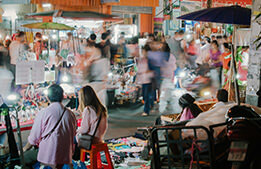 Richmond, BC is home to two acclaimed Asian night markets, bringing the best of the Far East to the Canadian West Coast. Richmond gives visitors a unique "Far East meets West Coast Experience".